Whether it’s for school or BYOD (Bring Your Own Device) the iPad or tablet is first on nearly everyone’s wish list. At the same time there are those who are practical and see the need for a new light, high-performance notebook or ultrabook. Anyone who has tried one of the new systems agrees that the light weight and lightning speed of the new systems make them very enticing. A lot of the features people find desirable in the new systems are because they’re using solid state drives (SSDs) rather than traditional spinning hard drives. SSDs have been around since 1976, they didn’t begin to appear in mainstream consumer applications such as mass-marketed notebooks until 2006. Today, with SSDs delivering so many advantages over hard disk drives (HDDs), a growing number of notebook/ultrabook manufacturers are offering them as the standard storage solution. Using an SSD is no longer a matter of “if” or personal choice, but “when” people will be using an SSD-equipped computer. This is especially true with the floods in Thailand that have forced drive manufacturers to dramatically cut back on the volumes they can provide computer producers. Projections are that those volumes won’t get close to “normal” for at least six months. At the same time consumers are approaching the holidays and are reluctant to go significantly over their holiday budget this year. Especially for a new Mac or Windows ultrabook when the present system is “good enough” but lacks that extra oomph that SSDs provide. The answer for many will be to upgrade their notebooks by swapping out the HD so the processor and applications can deliver results better with an SSD drive. In just a few minutes the user has reduced the weight of his/her notebook, dramatically increased the performance, have a system that runs cooler and a significant boost in battery life. With hard drive prices rising it’s also nice to know you can put your swapped out hard drive to good use for yourself and your family. A wide array of external USB 2.0/3.0 hard drive enclosures are available that enables users to very quickly, easily put the old hard drive back to work in your office or home. 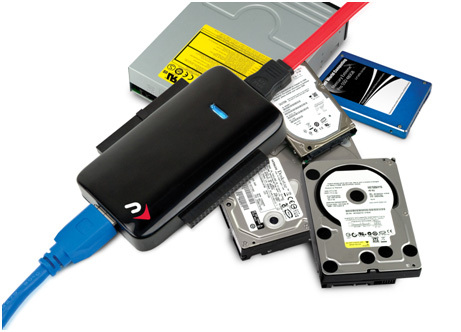 Whether it’s a 2.5, 3.5 or 5.25” drive there’s an enclosure that will quickly give your desktop or portable computer access to up to 3TB of storage capacity. The majority of the hard drive docks come with everything you need including online step-by-step guides on installing/formatting the drives. Companies also provide information, assistance on how to stack added hard drives and daisy-chain them for espanded storage across multiple hard drives. Last Spring, Gartner predicted that consumer solid-state drives will have a break-out year in 2012 due to falling prices, which will make SSDs a primary storage option for mainstream users. According to an IDC study, while other form factors of computers have generally remained flat in terms of unit sale growth; between 2009 and 2011, the number of consumer notebooks shipped is expected to double. In the portable device arena, the worldwide unit share for notebooks is projected to remain near constant through 2014, making portable Macs and PCs critical components of digital device use, alongside the explosive growth of tablet use. Driving the recent growth of SSDs in both notebook and desktop use is a reduction of the perception that SSDs are too expensive. According to Gartner Research, the Cost per Gigabyte as recently as 2010 was over $2.00 per GB. As volumes increase, future estimates place this cost at $1.00 for 2012 and below $0.50 by 2014. – Incredible speed boosts to boot times, application loading, and overall system responsiveness. It’s not just consumers and prosumers that benefit from SSD use; they’re also ideal for enterprise and data center deployment. With an estimated volume CAGR of 57 percent for 2010-2015, Gartner views enterprise SSDs as a significant growth opportunity. With all their benefits and proven use among all levels of technology users, it’s no wonder the wave of SSDs for reliable storage and backup performance is gaining momentum. 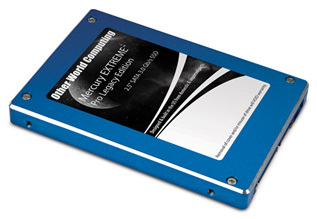 To give your customers even greater confidence to dive into an SSD, OWC offers the longest warranties in the industry…up to five years….plus backs them and all their products with free 24/7 US based support. This year it might be a pleasant surprise to get more for less with your computing dollar. If you’re thinking about a new system but want to stretch the holiday budget, you may want to take a look at the upgrade option this year. Visit www.macsales.com.